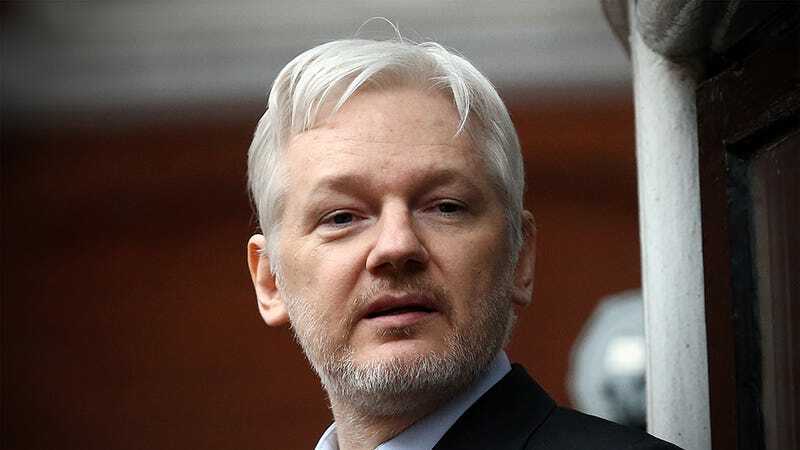 Assange didn’t say whether Wikileaks will re-employ the “ethical leaking” guidelines it has all but abandoned in its last three major data dumps. As Gizmodo previously reported, Wikileaks included dozens of credit card and social security numbers in the 19,252 emails it published from top US Democratic National Committee members. The organization has also been criticized for “putting women in danger” when it published emails from the Turkish government earlier this year. Assange has gone to great lengths to control the conversation about the “information war” he’s currently embroiled in. He even recently stooped as low as the politicians he so frequently criticizes when he lied on national television about the information Wikileaks published in the DNC email dump. In an interview on the HBO show Real Time with Bill Maher, Assange said Wikileaks “did not publish full credit card numbers” when it in fact had done just that. Assange doubled down on his claims when he refused to answer CNN’s Jake Tapper’s question about criticism toward even modest curation. So why hasn’t Assange published the new leaks yet? He told Megyn Kelly he and Wikileaks editors are “working around the clock” to vet the materials and get them ready for publishing. Assange has not said whether the new leaks will include sensitive personal information, but it seems inevitable. As its founder said, Wikileaks is now focused on publishing “pristine archives under the rubric of ‘scientific journalism.’” Apparently, science and privacy don’t mix.